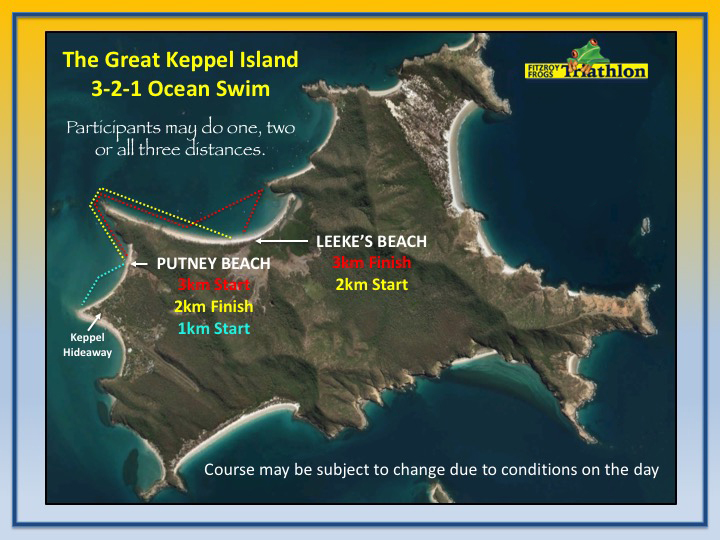 Fitzroy Frogs are headed to Great Keppel Island (GKI) for a weekend of swimming, running and random fun (SR&RF). And you are invited to join us. 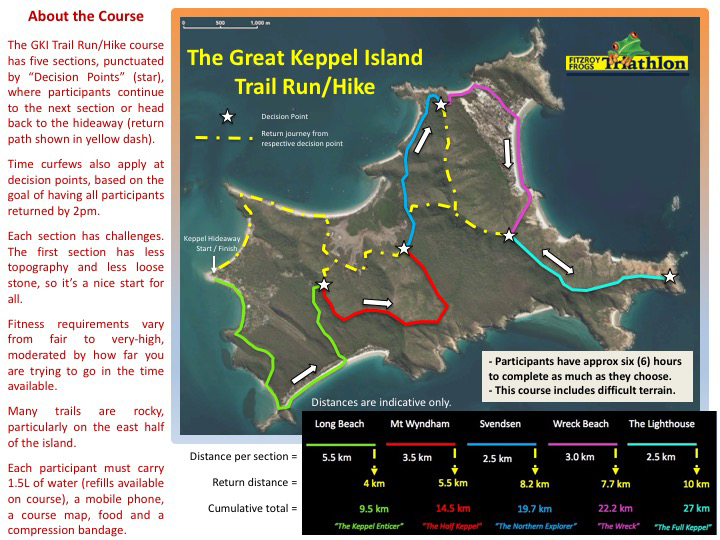 ABOUT THE GKI SR&RF WEEKEND For many years, CQ athletes have looked out across Keppel Bay and wondered “why don’t we have an event on Great Keppel Island?”. “Wonder no more Central Queensland, Frogs are heading to the island” When: Friday 19th October to Sunday 21st October Why: Because we can What will we do: Swim, run and have lots of random fun EVENT DETAILS Event details may vary a little, but the program will look something like the following: Saturday morning: – Ocean swimming (3km, 2km, 1km and 500m events, including all four if you are up to it) – The 3km swim will commence at 8:45, which allows participants not already on the island to catch the 7:30am Keppel Konnections transfer from Rosslyn Bay harbour Saturday afternoon: – Random Fun – why not hire a kayak and/or some snorkelling gear from GKI adventures, visit some of the nearby beaches, practice your beach volleyball or find a shady spot under a palm tree – For anyone leaving the island on Saturday afternoon, your transfer departs at 4:00pm – If anyone is keen, some swim coaching may be available too Sunday: – Trail running/hike (various distance options) – The run/hike will commence at 8:00am, which allows participants not already on the island to catch the 6:45am “Special” Keppel Konnections transfer from Rosslyn Bay Harbour – Participants are required to return to the GKI Hideaway by 2pm – For those of us leaving the island on Sunday afternoon, our transfer departs at 4:00pm Events will be relatively non-competitive, but participants will represent their Local Government area in “The Southern Reef Regional Challenge” “Event start times will be scheduled to allow participants to arrive on the early morning ferry, but please consider staying on the island to make the most of your weekend” EVENT ENTRY FEES Please note that U15 distance constraints may apply (Craig is working on it).